I've been hunting for a good coconut milk with no or at least minimum industrial stabilizers and preservatives. I found a brand called Aroy-D that produces coconut milk and also cream in paper cartons(so no BPA from cans) Here's a picture. One pack contains a phenomenal 2000 calories. It says 100% coconut milk. BUT! On the ingredients list it says 100% coconut milk. Now is it possible that they can sneak some guar gum and stuff in it without listing them? I've heard that since guar gum is contained in such tiny amount, it doesn't need to be listed. Or does the term "coconut milk" contains guar gum? i am pretty sure they either irradiate the coconuts or dip them in femaldahyde if they are conventional, your best bet is to source organic coconuts, just buy a case of mature ones, whip up coconut milk and store it in the freezer. Tell me you didn't just use the word 'mouthfeel'. That word belongs in the R&D department of some frankenfoods company. Call me a lazy caveman, but that's entirely too much work. How to make coconut milk: http://nourishedkitchen.com/how-to-make-coconut-milk/ Notice thick mature coconut meat full of yummy coconut fat. Coconut milk is not made from young coconut. Young coconuts and the coconut WATER in them are tasty, tasty, but much higher carb and lower fat than coconut milk. We bought some Aroy-D coconut milk in cartons. I see to be ok with it. I bought a nut milk bag on ebayUK a couple of weeks ago. I have used it with Blue Dragon creamed coconut and it has worked very well. I ate what was left in the bag with a little of the strained coconut milk, as a small dessert. Any worries since it's UHT treated ? Sorry, I should have translated that: Water, coconut milk (90%), antioxidants E330 (citric acid), Contains Solphites; may provoke alergies. This is what was listed for that Arroy-D 100 % percent coconut milk. It's odd that 2 different suppliers list different info. I doubt anything we are buying in a container whether can or carton is pure. As others have said, if the additive is under a certain percentage it most likely doesn't have to be listed. So maybe, some suppliers have their own internal rules and include what the importers are not including on the labels. Sorry this is more a rethoric answer. Hope some can learn something. Even if the Aroy has no declared Additives. It might have additives which dont have to be declared. The decleration is done by the food laws and if this allows something it wont be declared. What i mean is if there is additives in the package it probably will get in the coconut milk cause the milk is fatty and fat takes nutrients and also toxins. Ican read no preservative. honestly if i look at the package. ITs outside a mix out of paper and plastic and inner a layer of metalictissue, probably alluminium. There are additives which arent listed. And this are there cause of the production industry. If you go certified organic or small scall farms you know how it is produced and what they use. There wont be preservative inside the coonut milk. What about the package, fat easily takes toxins. So if the package is toxic the toxins go in the coconut milk. Go organic or something else trust . Look behind the shining stages. Guar gum is a thickener, not a preservative, as far as I know. Locally I seem to have a choice between coconut milk with guar gum but no preservatives, or preservatives and no guar gum. D'oh! I guess that would depend on where you get your coconuts from... and if they are organic or not. do they spray some chemicals on it to preserve young coconuts? Then take the fibers, add a little more water and blend it all again. Repeat the straining and squeezing process, until the fiber is dry again. Now you've got fresh coconut milk. The process is a little time consuming... But the results are well worth it. Be sure you drink the milk in 2 days or freeze it immediately, otherwise it will go bad. Once you have tasted this... You will never want to go back. Now remember those dry fibers? Dry them out a little more on a cookie sheet, then blend them till they are powder... You just made fresh coconut flour! Use it to make paleo baked goods. Now I've heard that with the fresh milk, you can also cook out the oils as well and get unfiltered coconut oil. I have not tried this, as the milk oil mixture is just too damned good to waste, and I don't want to cook out the flavor. Maybe one day I will try it though. With enough time put in you could easily have oil, flour, and milk for a few weeks. Of course this IS time consuming, and may not be for everyone. One option is to order coconut cream from Tropical Traditions and dilute it--about 1/4 cup cream + 3/4 cup water. It comes in a jar, so no cans to mess with, and has no additives whatsoever. And did I mention it is delicious? I don't think there is such thing as bpa free, guar gum free retail coconut milk. I've checked everywhere and I'm supersure there is something fishy with arroy-d. And yes, companies are allowed to say 100%. You see that in juice all the time yet if you read the ingredients it is made from concentrate, that 100% can be anything, so you cannot sue them for it. It could be 100% a drink for example. I'm chiming in to say I just made my own coconut milk from 'fresh' coconuts yesterday because, like the above comment from Jayan, at least then I know what's actually in it! And, well, the results were OK. I used a fine mesh nut bag to strain out the fiberous solids (I blended coconut meat with coconut water and filtered tap water) and the end product was sweet, but not smooth. The coconut fats like to separate into small globs and there is a somewhat grainy look to the whole batch, like a cream soup that has 'broken'. I'm sure the guar gum and other undisclosed thickeners are helpful in keeping the (canned and boxed) coconut milk 'creamy' and stop it from separating, but how healthy they are, I don't know. I'd like to make whipped coconut cream again, but so far the only way I have been able to 'whip' coconut milk is by starting with canned coconut milk that's been chilled. I simply could not do it with the homemade coconut milk, even after refrigerating overnight. I recetly tried coconut milk from a company called Diamond. I liked the taste but I think it was giving me belly aches which I suspect was being caused by the guar gum (E412). Guar gum is made from guar beans and I don't get on well with beans. I have used Blue Dragon creamed coconut to make my own coconut milk by adding it to boiled water. It's a bit sickly for my tastes and very bitty. I'm tinking about trying to make my own coconut milk from scratch but well over half of the coconuts we have brought here have been rotten so it sort of makes you wonder if it's worth bothering? I also would ask. What are the best packages to buy in? Cans? Or this plasticpaper packeges? What toxins are in the packages which goes in the coco milk? I'm a little wary of the other ingredients in some of the brands, but the Gold Rooster brand (not sure that's what it's really called) is the best I've found in terms of taste, mouthfeel, and its ability to work in coffee. The Aroy-D is OK, but I agree that it's a tad on the grainy side. The Premium Thai brand is awesome too, but at least twice the price of the Rooster where I shop. Are you opposed to buying frozen fresh coconut and just blending it with water? It won't be quite the same, but at least you'd know exactly whats in it. I've found frozen coconut milk in the freezer section at one of my local Asian markets. There are no other ingredients listed aside from coconut milk. They also sell frozen grated coconut. Both are frozen in 1 lb plastic bags and cost $1.69. Maybe you can ask your local store to order these. To Sage_michael's, For the Record, Coconut Milk is made from Mature ( Dry Coconut ) not Young Coconut. 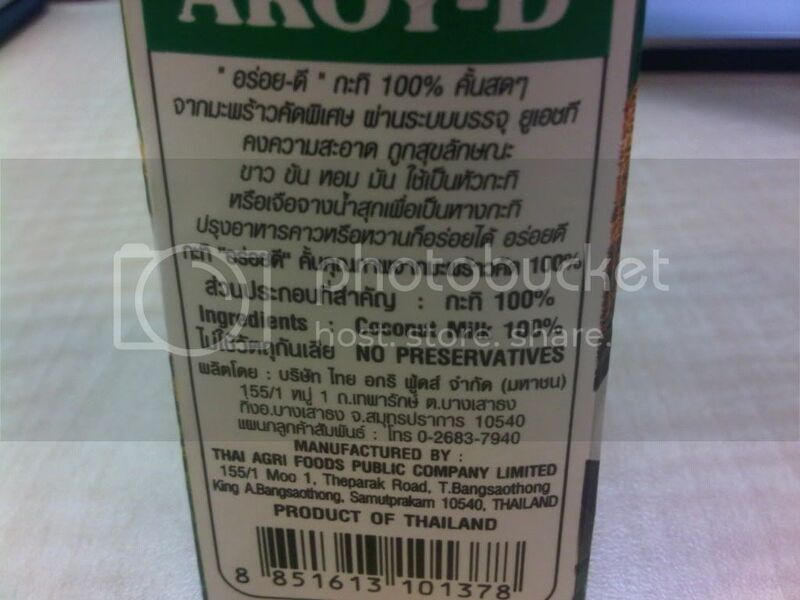 yoru question: I use Aroy D all the time and want so much for it to be 100% coconut milk but the label is confusing. Why does it say 100% then list Coconut extract 60% and water as ingredients? Coconut milk is coconut extract and water. So you can have 100% coconut milk with 60% coconut extract and 40% water which equals 100% coconut milk. Part of the coconut milk is the added water. Without the water it would be just coconut. I think it's best only to drink water for a whole range of reasons. Also a coconut if you split it open has hardly any liquid in it so in the wild etc we would certainly not have been drinking a lot of fluid from them. whats the issues with guar gum ?? Don't buy arroy-d imo. It has lots of guar gum or some other preservative because after drinking it the next day my liver is so stressed and I didn't eat anything suspicious besides the coconut milk. You can tell from just drinking it plainly it doesn't taste right, very grainy and bumblegum feeling you get afterwards. What makes me think there is something up with Aroy-D is that when I buy organic coconut milk with no preservatives from whole foods in a can, the milk separates and forms a thick block at the top of the can. This is something it should do. Now that doesnt happen with Aroy-D. This to me implies there is something in it keep it consistent. Anyone have further info? I use Grace Creamed Coconut, a solid that comes in a 170 gram box that doesn't need to be refrigerated after opening. It has no additives (PURE CREAMED COCONUT, NO COLOURING, NO PRESERVATIVE). Can be mixed with water as a substitute for coconut milk. It's easy to just slice off however much you need. (Unlike when you need just half a cup but have to open a whole can.) Sometimes I don't mix it with water, e.g. when the sauce already contains water and I don't want to add more liquid which would make the sauce too runny. I'd add a photo if I could figure out how! To supercharge its health benefits, I make a homemade kefir from using live kefir grains. The Asian market sells the cartons cheaper than what I've seen them selling for online, so it's worth the slight drive to stock up. So, the question still has not been answered on whether Aroy-D in the vacuum box 100% Coconut Milk is really 100% Coconut Milk. Can a Company lie about something being 100%? Has anyone called the company or written to the company to find out? I have 6 six cartons sitting on my self and have not used them yet, because I want to know the truth first. So, I am looking for the Address and Phone number to the company. I would like to write and call to get the truth on this one. Can anyone help on that one. Assuming is not enough for me. At the toko over here I buy a brand called TRS. On the ingredient list it says Coconut and some water. I don't mind the water. Whereas I bought a can from another brand,which stated to be 99,9% pure coconut milk but it had some preservative in it,being the 0,1%. So,I figured the 0,1% couldn't be noticible,but I found it had a 'funky' taste to it. So,I stick with TRS....just no clue if this is the real deal.According to the owner of the store,TRS is known to list every ingredient on their products. thank you for this eye-opener. I use aroy-D all the time. (from the asian markets) There is only one other brand that I can get here (Blue dragon). No difference from one to the other and blue dragon is sold in health food stores. The label actually says 60% coconut milk and water. (it is very dense though) What you should know is that the brand name is not important but the manufacturer. In this case: thai agri foods public company ltd. I say this because there is another identical can with a different name for the Italian market (though both are sold here) that is produced by the same company. 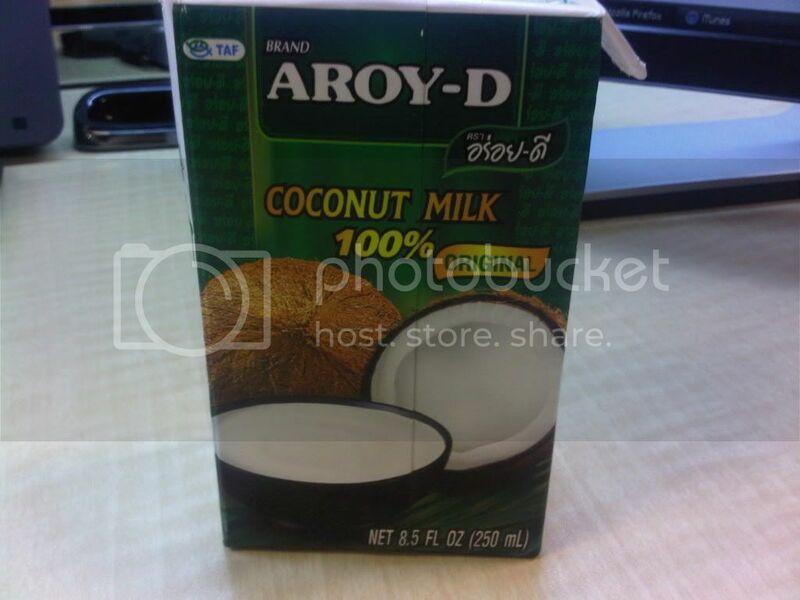 Yes, Aroy-d does have two versions of the coconut milk, which doesn't make much sense to me. One intended for making deserts which is what I use and one for cooking. Thanks to you I googled a bit: I found this for the can: Ingredients: coconut milk 55%, water, potassium metabisulfite (as perservative). Unsweetened. 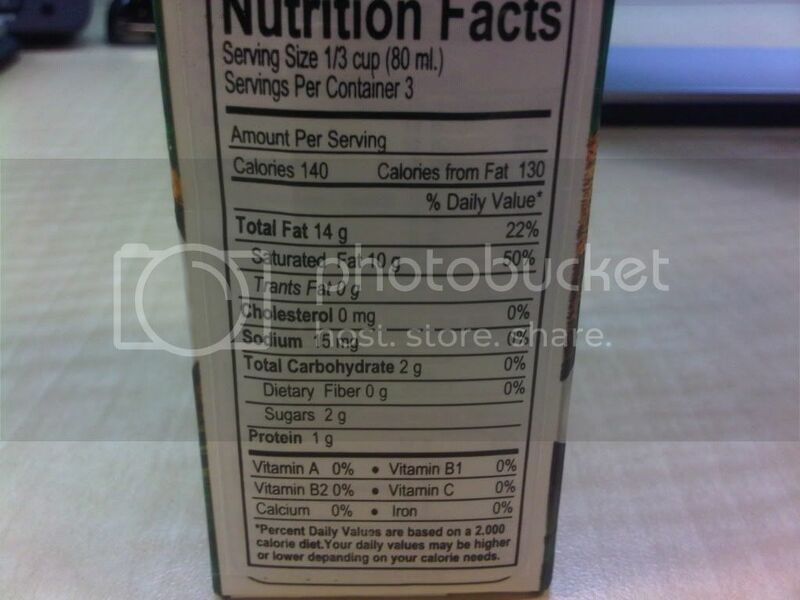 Yet it appears that the carton is in fact 100% with no preservatives. and more: (E 220) Sulphur dioxide reacts with a wide range of substances found in food, including various essential vitamins, minerals, enzymes and essential fatty acids. Adverse reactions: bronchial problems particularly in those prone to asthma, hypotension (low blood pressure), flushing tingling sensations or anaphylactic shock. International Labour Organization says to avoid E220 if you suffer from conjunctivitis, bronchitis, emphysema, bronchial asthma, or cardiovascular disease. scary. Now I have a new problem: (no cartons here) Where to get my coconut milk. I guess the obvious: fresh coconuts. Yep, the Aroy-D in the vacuum box is what I use. It's the only one I can find at my local 99 Ranch (West Coast Asian grocery store chain) that lists 100% coconut milk. There are plenty Aroy-D varieties in different cans with different levels/percentages of coconut milk. I've seen some label "for cooking" and "for dessert" with anywhere from 55%-65% coconut milk. The rest is additives such as guar gum and even water. This is even within the Aroy-D line of coconut milk. Therefore I stay away from the canned versions. Attached is the Aroy-D in the vacuum box. They're $0.99 each at my 99 Ranch (SoCal). I was wondering the same thing. I am finding it extremely difficult to find the perfect coconut milk. Arroy-D comes pretty darn close, but like you said, I am worried about hidden ingredients. My favorite brand is Phoenix Barge. I usually buy the coconut cream, not the coconut milk. In Thailand, where the stuff comes from, they consider the juice that comes from the first pressing of the coconut meat to be "cream," and anything that comes out after that to be "milk." I find the cream has a stronger coconut flavor, and is thicker. Phoenix Barge is the only brand I've found in the Asian grocery stores that contains only coconut cream and water (according to the label), and doesn't have the preservative potassium metabisulphide in it. It seems to make sense, since it goes bad after opening a bit faster than the stuff that contains potassium metabisulphide. What you buy is also what I buy. It's the best that I've been able to find in Toronto. Considering that the expiry date is more than a year in the future, I suspect that there's a preservative such as guar gum. As you said, it's likely that the amount of guar gum is so little that Aroy-D is not required to list it. Either way, I think it's the best product available. It's worth a try..I bought 6 today from the Asian store. (In a can,sadly,but in this town,beggars can't be choosers).Little thinner and less sweet than the standard varieties,but not bad.Nothing in it but water and coconut milk. I use Aroy D all the time and want so much for it to be 100% coconut milk but the label is confusing. Why does it say 100% then list Coconut extract 60% and water as ingredients? "Standard Transformers is a private limited company engaged in manufacture, testing of Transformers & Rectifiers Stabilizers in the voltage class of 11 KV to 132 KV and rating from 10KVA to 40 MVA. "